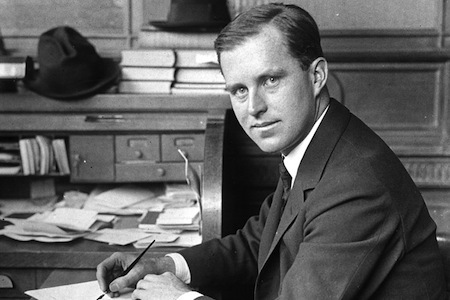 Was Joseph Kennedy Really an Anti-Semite? Fatima Ahmed-Farouta is a former HNN intern. Was Joseph P. Kennedy, the father of President John F. Kennedy, really an anti-Semite? David Nasaw, Kennedy's recent biographer, defined an anti-Semite, for the purposes of his book The Patriarch, as "someone who believes that there's something in the genetic makeup -- in the blood -- of Jews that makes them sinister, corrupt, and committed to destroying Christian morality." Under this definition, Charles Lindbergh and Henry Ford were anti-Semites, as were other officials in the State Department. Kennedy, he argued, was not an anti-Semite in that sense. But Nasaw admitted that Kennedy believed in a Jewish conspiracy to push the United States into an unnecessary war with Germany. And as ambassador to the United Kingdom from 1938 to 1940, he was in a position -- even if he wasn't a believer in "scientific" anti-Semitism -- to do far more damage to European Jews than his stateside contemporaries. A wealthy and influential man in political circles, Joseph Kennedy was appointed ambassador to Great Britain by President Franklin D. Roosevelt, and according to Richard Breitman and Allan Lichtman, both professors at American University in Washington, D.C. and authors of the recent book FDR and the Jews, his unlikely appointment (Kennedy was an Irish Catholic) was because Roosevelt wanted Kennedy out of Washington. Parts of British society, in which Kennedy found himself enjoyably immersed, argued that appeasement of Hitler was the best option. This was not uncommon thinking at the time, and indeed appeasement was the official policy of the British government until 1939. Kennedy, on his arrival at London became affiliated with the aristocratic “Cliveden Set,” who were not only pro-appeasement, but also in favor of improved relationships between Great Britain and Nazi Germany. Before long, his views on how to deal with Hitler mirrored those of the circle. In late 1938, the Intergovernmental Committee on Refugees was established at the instigation of President Roosevelt to find ways of addressing the German refugee question. FDR asked British Prime Minister Neville Chamberlain to reason with Hitler to allow German Jews out of the country, with at least some of their possessions in order to finance their new lives abroad. Kennedy, as the ambassador, was tasked with passing the message to Chamberlain,, but instead of delivering the message personally, Kennedy passed the message on in writing, then said in an interview to The Nation that he was all for the committee so long as it did not stand in the way of other interests. On Kristallnacht -- the Night of Broken Glass, November 9-10, 1938 -- one hundred Jews were murdered in Germany, and about 30,000 Jewish men were rounded up and sent to concentration camps. This was officially sanctioned by the Nazi government, and by now the writing was on the wall for German Jews. The governments of the United States and Great Britain were shocked but were unable to arrive at quick solution to getting Jews out of Germany. As FDR lobbied Congress to increase in the quota for refugees, amid a domestic political climate rife with anti-Semitism, the press reported that Kennedy seemed to have his own refugee plan. No one seemed to know what that entailed, however. What was clear was that the Kennedy position was appeasement and the development of business ties with Germany.